Official festival apps have become indispensable survival guides to any big music festival. You can check out the map to find the nearest place to buy beer, and get notifications about last-minute lineup changes. Similarly, music festival organizers and promoters also rely on these apps—for all the user data they collect. “We can literally, in real time, take a look at how people who are utilizing the app are migrating around the facility,” said Creighton Burke, vp of digital strategy at AEG Live, during a panel at South By Southwest on how data is impacting music festivals. AEG Live puts on 25 music festivals a year, including Coachella and the New Orleans Jazz Fest. This April, Coachella will return after a record-breaking 2015 that had almost 200,000 attendees jammed-packed to see their favorite bands over two weekends. And once again, AEG Live is working with app developer Aloompa to create an iOS app and Android app for Coachella. Aloompa’s co-founder Drew Burchfield, who also participated in the panel, said that if Coachella-goers have opened the app and their Bluetooth is turned on, his company’s beacon technology can track their location down to a foot. Although this tracking feature sounds alarming, Burke pointed out that Coachella tries to leverage this data in a way that’s “not creepy.” Instead, festival organizers uses this location data as a “gut check” and to cut through the hype. They can compare which artists you favorited, starred, or scheduled using the app and which artists you actually checked out once you get to the festival. The data is also used by promoters to inform their decisions about booking artists that better resonate with a specific audience. For example, Burke was able to tap into the Aloompa data to find out that when electronic duo Flosstradamus performed at Coachella right after rapper Tyler the Creator, 40 percent of the audience stayed to watch both acts. So when he was tasked with finding an opening act for Flosstradamus, he had the data to support booking Tyler the Creator again. Music festivals are a big business. They draw over 14 million people every year, and these fans spend upwards of $1.34 billion on live music, according to one recent study commissioned by AEG Live. So it makes sense why managers and executives would want to know as much as they can about the fans that make up this billion-dollar industry. But according to one SXSW panelist, music festivals can’t really license their data to third-parties without the appropriate permission from users. “It’s not up to the festival or even the artist, it’s up to the fan. They have to say, ‘I’m okay with that,’” said Jeff Cuellar, VP of strategic partnerships at AC Entertainment, which puts on the Bonnaroo music festival in Tennessee every summer. When festival-goers install the Bonnaroo app, also developed by Aloompa, they only give permission to the festival to have that data. Cuellar admitted that Bonnaroo does share “higher-level statistics” about who attends the festival and how many festival-goers like a certain artist on the app, but the festival does not hand over individual user profiles to other companies. While Cuellar and Burke both stated that taste, instinct, and personal connections still play a role in creating a music festival lineup that will attract millions, there is now enough user data to completely automate the process. Burchfield pointed out that in 2015 one particular festival’s lineup was fully data-driven. According to Burchfield, this festival was successful and is planning to repeat the process again this year. Beyond creating the perfect lineup, the panel said that data is going to help festival producers create more intimate, tailored experiences, as well. 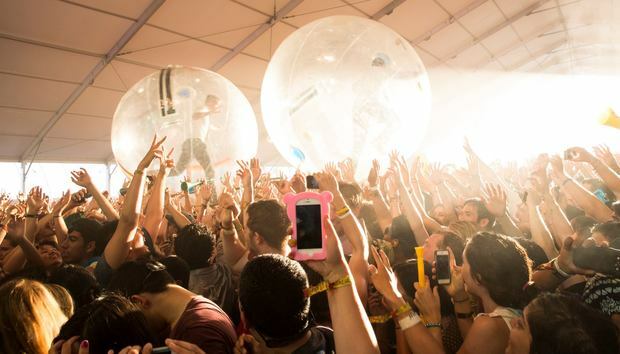 Although major music festivals rely on technology more than ever–from generating buzz on social media to seeing in real-time where festival-goers hangout–the SXSW panelists all agreed that the live experience is still king. And that emerging technology like virtual reality, live-streaming, and even holograms are used with the intention to augment that live experience, not replace it. “Nothing will mirror the actual experience of being on-site,” Burke said, adding that he’d be “stunned” to learn that people watch a festival broadcast on their mobile device for any longer than 15 minutes. And when producers try to replicate that live experience, the results can sometimes backfire. “When I was at Live Nation, we took a broadcast of Madonna in Paris and put her onstage in a hologram at the House of Blues in L.A., and I’m watching this and thinking, ‘This is really f**ked up. Who’s going to spend $30 for this?’” Burke said. By the same token, however, Coachella created an OMG-moment when a hologram of late rapper Tupac performed alongside Dr. Dre, Snoop Dogg, and Eminem back in 2012. “That speaks to the festival experience,” Burke added. Last week, Coachella proved the festival was committed to these augmented experiences by announcing that all attendees would be receiving a Google Cardboard viewer to watch VR content on the app while on-site. “Our customers are reading about [VR]; we need to offer it in some form,” Burke said. But this was not a data-driven decision, he said. It stemmed out of a partnership with Google. In addition, Coachella is partnering with Here wireless earbuds, awarded SXSW 2016’s “Best in Show,” so that festival-goers can add sound filters to the live performances. “We’re all about heightening the experience, while staying sober,” Burke said.